A moment in time captured- as it turns to dusk and the sun starts to set, the heavy storm clouds give way to the light. Photo taken at my studio as I have just finished throwing this vessel on the wheel. I am fortunate enough to be surrounded by nature, and love observing its characteristics. Childhood memories of collecting colourful patterned shells and rocks, or even now, watching as the sun sinks low on the cloud streaked horizon, as the ocean tide laps at the shoreline creating its own story on the sand. Within my work I reflect colour, form and feeling. The intent is not to replicate objects, but to simply translate something seen, or experienced in a unique and interesting way. My ceramic forms are there to be explored, to draw you into their own internal worlds, to be discovered and unveiled. This series speaks of layers of time...Consider the way that earth and nature layers itself with beautiful rings of colour, such as the patterns that occur in tree rings showing its growth; or colour bands of minerals found in cross laminations of earth, such as Liesegang bands. Take a moment to consider where you have experienced bands of colour in nature. What memories come to mind? What does it signify to you? 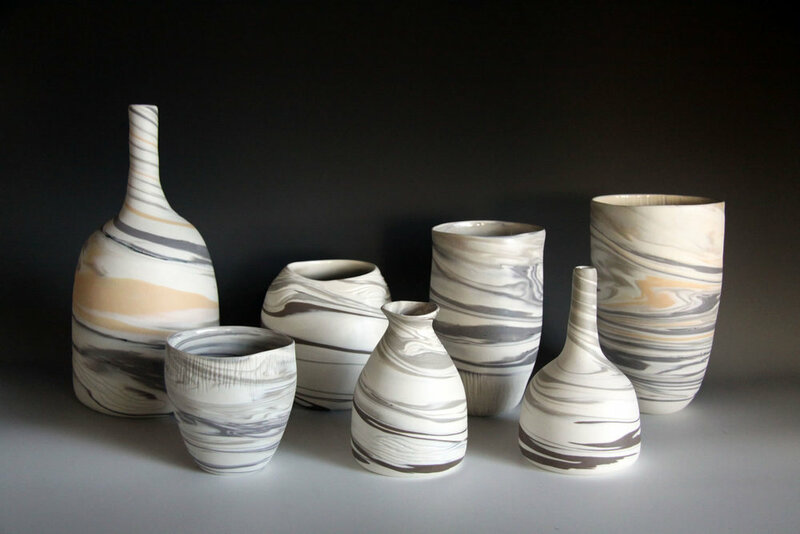 These works are created using hand coloured clay, built up in layers (ie white, grey, white, black, white, yellow, white) in a technique called agateware, which is the English term, or Neriage/ Nerikomi which is the Japanese term. The clay is ‘laminated’ together and slapped or wedged to eliminate trapped air. The clay is then thrown on the potter’s wheel into a vessel. Depending on the amount the clay is mixed, the direction the wheel spins, and the thickness and shape of the piece; the lines of colour will emerge in varying degrees in a spiral like fashion throughout the work. Each piece then goes through a variety of processes such as trimming, turning a foot rim, carving, sanding, glazing and multiple firings, before being installed back in its grouping. Each item is unique and goes on its own journey.